Operation’s original theme was the Western-influenced Death Valley. 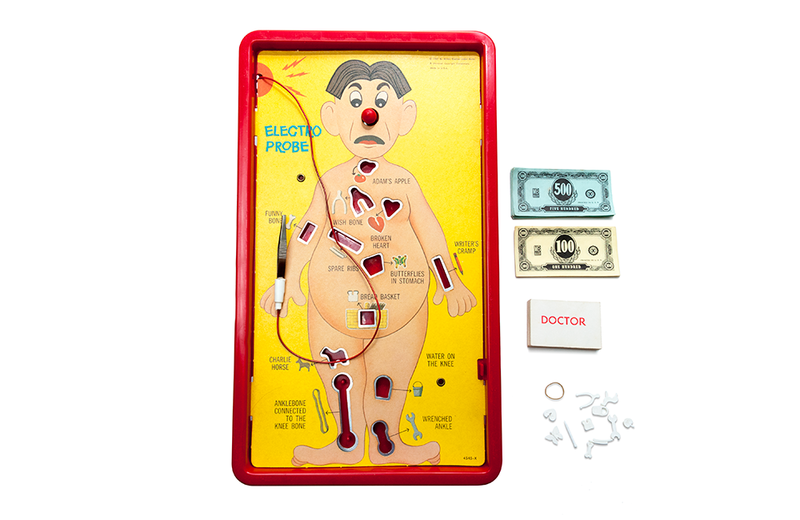 For over 50 years, budding physicians have been able to hone their fine motor skills by playing the Operation game. The “wacky doctors’ game” challenges players to perform successful operations by removing parts from a series of twelve holes in the body of a patient appropriately called Cavity Sam. The surgical implement du jour is a pair of wired metal tweezers. As the game’s original television ads explained, it “takes a steady hand” to succeed in Operation. Players who were unable to extract a body part without touching the metal sides of the game board were greeted with a buzzer while Sam’s nose lit up in red. The game was powered by two D-cell batteries located underneath the board. In the original release, Cavity Sam contained 12 different removable body parts, each given a funny name, like Wrenched Ankle, Butterflies in Stomach, and Spare Ribs. Milton Bradley referred to the parts collectively as “Funatomy”. Game Play was simple. A series of Doctor and Specialist cards determined the operation to be performed. Success netted players cash and the player with the most money at the end of the game was declared the winner. Operation was invented in 1962 by John Spinello, while he was an industrial design student at the University of Illinois. 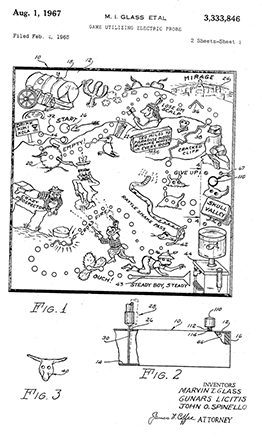 His prototype was an electrified 10×10-inch box that incorporated a 12-volt lantern battery and 6-volt bell. Through a family connection at famed toy design firm, Marvin Glass & Associates, Spinello sold his creation for $500. Glass subsequently filed for a patent for a “Game Utilizing Electric Probe” on February 4, 1965, and U.S. Patent #3,333,846 was granted on August 1, 1967. The game’s original theme had nothing to do with medicine, and Cavity Sam was nowhere to be found. Spinello’s creation first morphed into a Western-based game called Death Valley. Players used a metal probe to move along a game board with an electrically-charged desert-motif. Death Valley was fraught with perils that included gunfire, rattlesnakes, and mirages. The game was soon licensed to Milton Bradley, which kept the game-play concept but changed everything else, resulting in the operating table game that would become a franchise for the company. The first Operation game officially hit store shelves in 1965. Hasbro eventually acquired Milton Bradley and the rights to Operation. The game’s continued popularity has led to a series of spin-offs, including version themed after movie and television shows. Anne D. Williams – puzzle historian, collector, published author, and professor – writes about the history and appeal of jigsaw puzzles.